Attestation of documents from Ministry of External Affair (MEA), Government of India, New Delhi, is required to make it valid for use throughout India and in a foreign country. MEA is the only apex body having the authority to attest the documents issued from India. MEA attest the document or issues Apostille Stamp as per the requirement of the applicant. The Ministry of External Affairs (MEA), Government of India has outsourced its General Attestation and MEA Apostille Documents services with effect from March 1, 2012. After the outsourcing of collection and delivery of Documents for Attestation/Apostille Services, No Document from individuals is accepted by MEA Counter at CPV Division, Patiala House, New Delhi. The original documents are to be submitted by all individuals directly to the outsourced agencies along with a photocopy of the document and a photocopy of the Passport of the applicant. As approved by the Ministry of External Affairs, New Delhi, vide their letter No.Q/QI/433/01/2016 dated 2nd November, 2018, following will be the Apostille fee, Service fee and Scanning fees with effect from 01/01/2019. MEA Attestation is done after the respective State Govt. authority has attested a particular document with its signature and seal of the Department. A list of the Regional Authentication Centers and the designated authorities may be seen at the Ministry’s website http://www.mea.gov.in/. All original documents/copies requiring attestation from MEA must first be authenticated by the designated authorities of the concerned State/Union Territory from where the document is issued. For Educational documentsThe documents should first be attested by the Education Department/ Human Resource Development (HRD) of the concerned State Government/Union Territory. The authentication must be done with the name and designation seal as well as the seal of the Department. 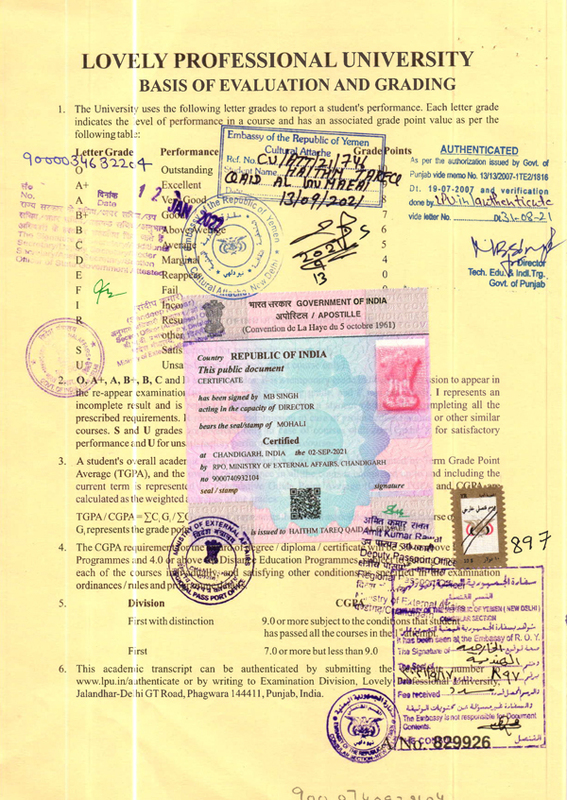 For Non-Educational documents Attestation by State Home Department or General Administration Department (GAD) of the document issuing State Government/Union Territory with the name and designation seal of authorized officer/Department. Commercial Documents,These are to be pre-authenticated by the respective Chambers of Commerce. The rubber stamp of the respective Chamber of Commerce must be affixed on each document along with the name & designation of authorized signatory. The Ministry of External Affairs (MEA) thereafter, legalizes/attests the documents on the basis of the signature of the designated authorities of the State Government/Union Territory/Chambers of Commerce. Hence it does not take responsibility of the contents of the documents. The countries that have not signed the Hague Convention of October 1961 require a general attestation by the MEA, India, for all Indian documents. The documents attested by the Ministry of External Affairs, New Delhi, are accepted by these countries as valid documents and they process these documents further through their diplomatic embassies/consulates to be used for various purposes in their countries.